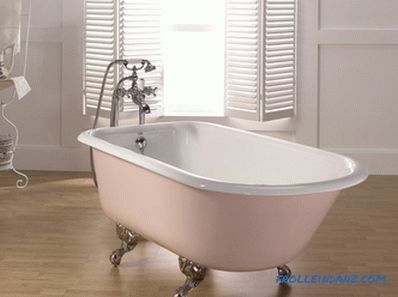 A bath is an obligatory attribute and the main subject of sanitary ware in any bathroom. In this case, often, the bath performs the function of not only the subject of hygiene, but also serves for relaxation and relaxation. Lying in the bowl with soapy water, with a small amount of various additives and oils, allows you to restore the overall tone, make the skin smoother, or relieve stress after a difficult work week. In addition to the hygienic and health-improving function, the bathroom bowl, due to its large dimensions, is certainly involved in the formation of the overall interior of the bathroom. When wondering how to choose a bath, many users find themselves in a rather difficult situation. Indeed, in reality, the sellers of plumbing stores offer their customers to buy a bathtub from a variety of materials, while the plumbing models have a huge variation in size, volume and shape. As the name implies, cast iron baths are made from a type of metal like cast iron using a casting method. Cast iron itself is an iron (Fe) alloy with a high carbon content (C). To increase certain qualities of the alloy, silicon (SI), manganese (Mn) or sulfur (S) is additionally introduced into it. In general, the cast iron is not ductile, not flexible, very durable grade of metal. One problem is that it is fragile, but this does not affect the quality of plumbing fixtures made of cast iron. For example, for reference, to break the cast-iron bath will require remarkable male physical strength and a weighty sledgehammer, weighing about 10 kg. In the course of normal household use, the maximum that can happen is a soap dish or a razor machine that has been missed in a bathroom bowl. However, the cast-iron bath owes its durability not only to durable metal alloy, the plumbing surface coating also plays a significant role. As a coating of a cast-iron bath, two-layer enamel is used. Rather, a layer of enamel alone, but applied in the factory it is in several approaches. The first layer provides proper adhesion of the enamel to the metal, and the second layer is the front layer, that is, provides the necessary smoothness of the surface. The duration of abrasion of the enamel coating of the cast-iron bath is from 10 to 30 years or more, it all depends on the intensity of operation. If you correlate all the advantages and disadvantages of cast iron baths, then the conclusion is that this plumbing fixture is ideal for installation on the first floor of a country house. For a bathroom in an apartment that has a relatively small area, this plumbing will be too cumbersome, and its installation will be difficult. Although at present cast-iron baths are installed in a large number of apartments still of Soviet construction. You should also recall such a popular suburban housing, lightweight type. Installing a cast-iron bath on the second floor of the house from a timber or frame housing is not desirable because of the large weight of plumbing. No noise when typing water. Time-consuming enamel recovery process in case of its damage. Baths of structural steel look very similar to cast-iron plumbing. Their wall thickness can be from 2.5 to 4.5 mm, and acrylic enamel is used as a coating. On sale there are both classic-shaped baths in the form of an oval, and plumbing of the most bizarre configurations: with one or more seats, with various headrests, shelves and bends. This is achieved thanks to the ductility and ductility of sheet steel, which is not the case with cast iron. Stainless steel baths are less common in the domestic plumbing market, although, if you search well, you can still buy a stainless steel bath. Small demand is mainly due to the high price. 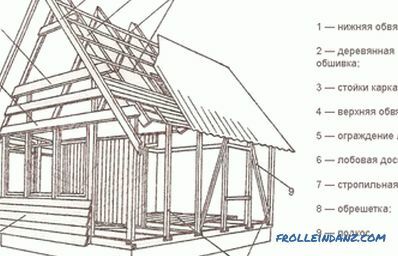 For example, a bath of structural steel is cheaper than a cast iron of about 3-4 times. While the stainless steel bath can cost the opposite, 2 times more expensive than cast iron plumbing.The fact is that a stainless bath does not have an enamel coating, that is, the bowl surface is a polished metal and, in order to extend the plumbing period and avoid corrosion or oxidation on its walls, manufacturers use food-grade stainless steel, the price of which leaves much to be desired. The degree of deflection of plumbing walls is directly dependent on the thickness of the metal and the load exerted. Asking how to choose the right bath, first of all, it is necessary to take into account the complexion of the bodies of family members. For example, if there are members in the family who are overweight, then buying a bath of steel is worth considering, since the walls of the plumbing will be affected by the weight of the obese person and the weight of the water filled into it. All this can lead to deformation of the walls of the font. If the weight and complexion of households are normal, then the purchase of a steel bath with a wall thickness of 3 mm would be an excellent solution for both the apartment and the country house. In the first case, Penofol (or analogs), rubber sheet or rubber is stuck on the external bottom of the plumbing. Plate thickness approximately 10 mm. 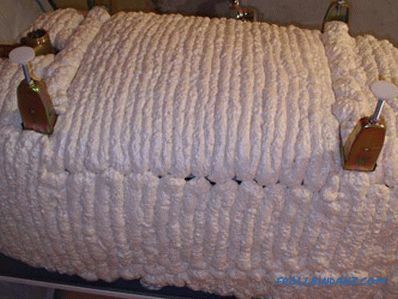 In the second case, the surface of the outer walls and the bottom of the bowl before installation is applied a shapeless layer of foam, which, when hardened will perform the function of sound insulator. Polymethyl methacrylate itself is a rather expensive material, but it has high strength, low water absorption, and a glossy, smooth surface. A bath of pure PPMA with intensive use in a city apartment can live for 12 years or more, but the price for this plumbing equipment will be 2-4 times higher than for baths manufactured according to a two-component scheme. In acrylic baths made according to the ABS / PMMA scheme, the outer glossy layer of polymethyl methacrylate is only 5-10% of the total wall thickness. It is clear that such a thin layer in 3-5 years can easily wear off due to operation. 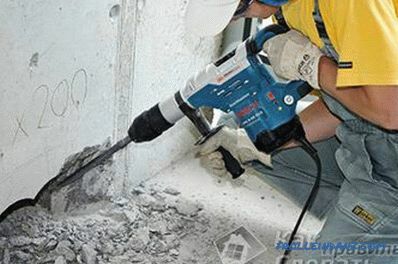 After abrasion of the first layer, the lower layer of the ABS begins to absorb moisture intensively, after which the entire plumber becomes unusable. 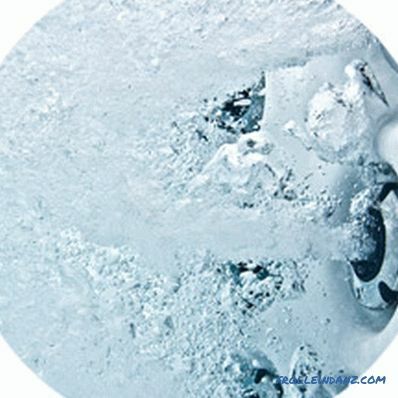 ABS hygroscopicity is not at all like a sponge, no, just the structure of this type of plastic is porous and, mainly, this material is intended for the base of plumbing, but not as a face surface. 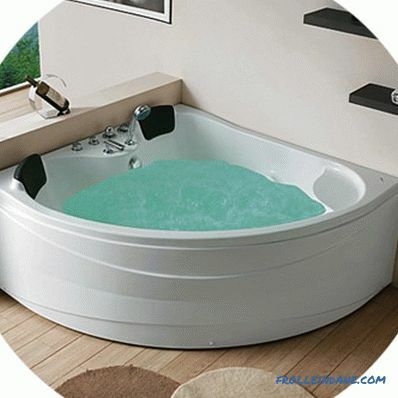 Acrylic baths from well-known manufacturers are of high quality. Their walls do not bend when the font is completely filled, and with the acrylic coating itself nothing happens even when using water with a temperature of 70 °. It turns out that if the choice is on the "acrylic", then determined with what to choose a bath, the main criterion is the technological scheme of its manufacture. For example, if it is necessary to install a bath in a city apartment, then it is better not to spare money and buy sanitary ware made of pure polymethyl methacrylate. If we are talking about installing a bathroom in the country or, in general, it is planned to rarely use it, then you can save a little and buy an ABS / PMMA acrylic bath. The price of some models is cosmic. Relatively recently, baths from the quail appeared on the Russian plumbing market. Mainly, all the plumbing from the quarry, represented by the products of the German company Villeroy. 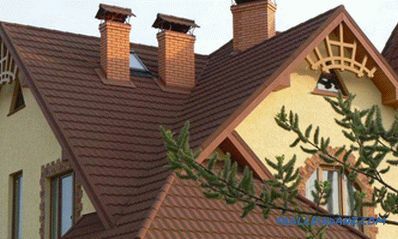 Boch AG, which is the legitimate developer of a new material and technology. Quarill material in composition consists of acrylic and fine quartz sand. During the hardening of such a composition, a structure is obtained when each quartz grain of sand is enclosed in a shell of acrylic, with each grain of sand being associated with a neighboring similar particle. In practice, the material turned out to be visually and in its smoothness much similar to acrylic, but quark is superior to acrylic in strength and durability. 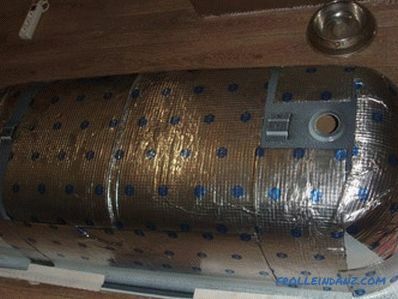 The wall thickness of the quark bath is approximately 9-10 mm, while if the acrylic plumbing equipment was necessarily reinforced from the outside with several layers of fiberglass impregnated with polymer, then the quarion baths do not have such reinforcement. Another feature of the quartz bath is the ability to purchase and operate a model that does not need a power metal frame to install. There are a huge number of quarian bath models, which are visually similar to cast-iron baths and whose installation is performed on legs. Habitual classics created from modern materials. Among the disadvantages of quarry baths, it is possible to distinguish their relatively large weight compared to acrylic fixtures, and the high cost. Ceramic baths, according to the method of production and materials, are divided into faience and metal-ceramic. At cost, faience plumbing is the most expensive. It is made of faniron - chamotte faience, that is, noble varieties of white clay. Fanierton itself, even after high-temperature firing, is a very hygroscopic material with water absorption up to 16%. For this reason, after the formation of the bowl bowl and the passage of its temperature hardening, a layer of acrylic glaze is applied to the surface of the chamotte faience. 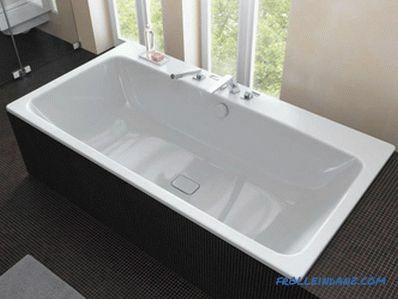 Ceramic-metal baths differ significantly in manufacturing method and cost. 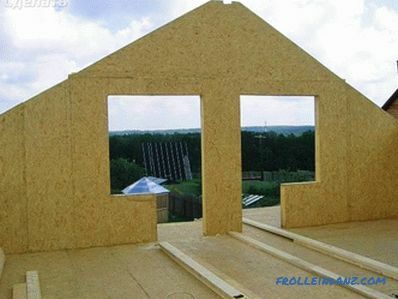 During their production, a metal frame is initially assembled - the base, which is subsequently enveloped in alumina and subjected to high-temperature calcination with subsequent glazing. The main difference between metal ceramics from pure ceramics is the smaller thickness of the walls of the font and much lower weight. The price of cermet is lower than on pure ceramics. This is mainly due to the lower consumption of expensive white clay. With regard to models of ceramic baths, in the Russian market plumbing most often there are baths with classic oval shapes. The color can be white, blue, turquoise, beige, and even coffee. Ceramic baths with unusual shapes in the form of a round saucer, with regular geometric angles or with a figure-eight font appear much less often. Choosing a particular material and color range, they proceed to the choice of the optimal size of sanitary ware. The height of the plumbing is determined based on the average height of family members, and it is also taken into account whether there are children among the household. For an adult, the optimal height is 65-70 cm. However, if there are small children in the family, it is better to choose a lower bath. The depth of the bowl is the distance from the bottom of the font to the upper edge of the side or overflow siphon.Determining the depth, it is important to take into account the moment that when filled, the water should completely cover the person lying. On average, the optimal depth is 50-60 cm. The length and width of the bathroom are selected based on the individual characteristics of family members. The average length of the font is 150-180 cm, and the width is 70-80 cm, however, these data are calculated for a person with a height of 170-180 cm and not inclined to fullness. The position of a person's body, depending on the size of the bath. Now let's talk about the size of baths made of specific materials. 1. Cast-iron baths are presented on the Russian market in two categories: miniature 70 x 120 cm, sometimes miniature plumbing equipment with a length of 130 cm appears on the market; and European standard bathtubs, with a length of 140-150 cm and a width of 70 cm. As can be seen, cast iron baths are very limited in the variety of bowl dimensions. 2. Steel baths are made with a bowl length of 150-180 cm, and a width of 70-85 cm. Sometimes there are baths of steel of the class "economy". There is more likely to save not money, but space in the bathroom, since the length of the font can be only 120 cm. 3. Acrylic baths in front of the consumer reveal the widest possibilities. On sale you can find models with a long bowl of 120-190 cm, and a width of 70-170 cm. Much depends on the shape and overall configuration. 4. 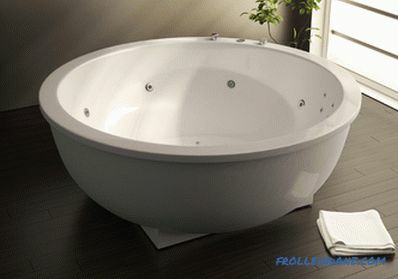 Ceramic baths with a classic oval bowl most often have dimensions: length 130-170 cm and width 65-75 cm. Again, much depends on the configuration of the plumbing. When deciding on a plumbing shape, first of all, it is necessary to choose the type of bath. 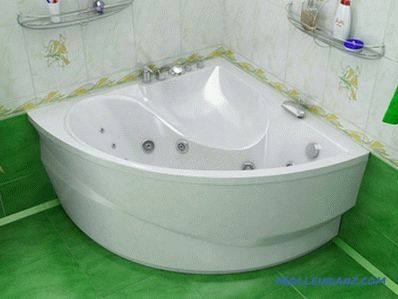 Wall-mounted bathtubs can be installed close to one wall, or in general, be removed from the walls in the room. Corner, as the name implies, are installed in one of the corners of the bathroom. 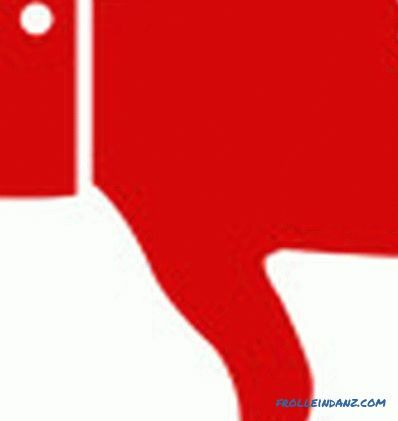 Consequently, its possible form depends on the type of plumbing. The wall type has more different variations of shapes. The most popular form is, of course, the oval, but there are models with the shape of an ellipse, circle, figure eight, or with asymmetrical curved lines. Corner baths are most often found with the shape of a quarter of a circle with the correct geometry. Less common are angular fonts with an asymmetric, intentionally irregular shape. 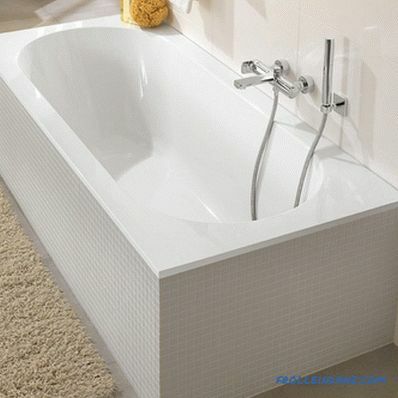 An example of an angular asymmetric bath, it can be either left-sided or right-sided. 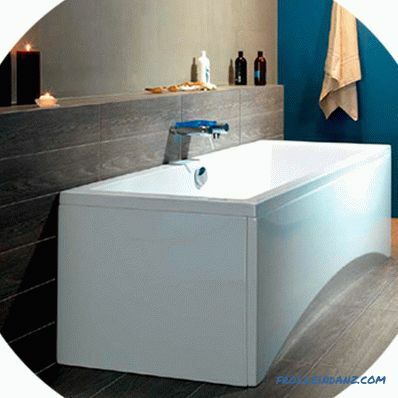 When choosing a bath for a city apartment, it is important to consider the accessible area of ​​the bathroom. The area of ​​the room, the minimum set of furniture to be located in the bathroom and possibly installed appliances, for example, a washing machine, are taken into account. From the area that remained after the calculations, and should be repelled in choosing the type of installation and shape of the bath. The availability of additional functions in its design may directly depend on the material from which the bath is chosen. 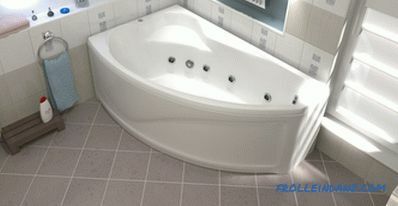 A cast iron or steel bath - additional options, most often absent. 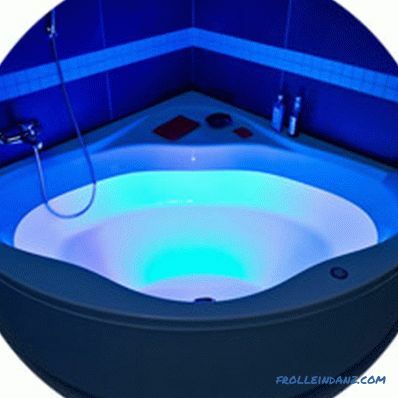 Acrylic or quarian bath - depending on the model, hydromassage, aero massage, chromotherapy, an empty bath disinfection system and a water level sensor can be built in. 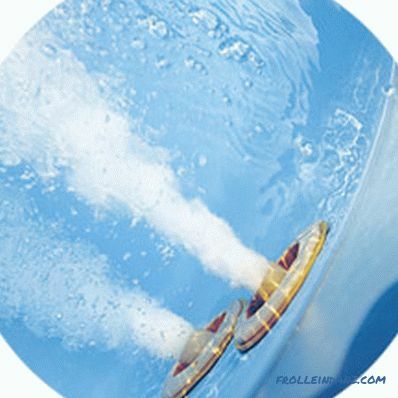 The hydromassage is realized due to the operation of a special installed pump that pumps water into the nozzles provided in the sides of the font. As a result, the effect of water flow is produced in the filled bath. This has a beneficial effect on the human body, and relaxation and improvement of tonus is produced. Aero massage, like a hydro massage, is produced thanks to the work of a low-power electric pump. With the only exception that from the nozzles located on the walls of the bath not the water jet but the bubbles of oxygen is supplied. Often, plumbing, in which combined and aero massage, and hydromassage, called in one word - Jacuzzi. Chromotherapy is a system designed to increase overall tone, improve blood vessel function and affect the body of a weak antibacterial effect. The principle of chromotherapy is the work of purple lamps in special reflectors during the adoption of water procedures. The blue lamps built into the walls of the font illuminate the body of the person lying on all sides. The auto-disinfection system is an additional option that, after taking a bath and draining water, delivers a disinfectant to the walls of the tub, which the system automatically automatically rinses off through special holes. Water level sensor - in principle, an adult does not need it. The main task of the sensor is to determine how much the bath bowl is filled with water, since, for example, if you turn on the hydromassage or aero massage with an empty font, then the main pump and all systems can quickly fail. The water level sensor, in turn, simply does not turn on the hydromassage with an empty bowl. 1. If we talk about cast-iron baths, then on the domestic plumbing market, we can single out the three largest sellers: Russian products of the Universal plant, Spanish products under the Roca trademark and French Jacob Delafon products. 2. Steel baths in the domestic market represent Russian manufacturers: Verkh-Isetsky Metallurgical Works and Lipetsk Pipe Works. Among the foreign sellers of plumbing products stand out: the trademark Roca is Spain, Bette is Germany, BLB is Portugal, and Estap is Slovakia. 3. Bathtubs from acrylic on the territory of Russia are imported from practically all European countries, as well as from Turkey and China. 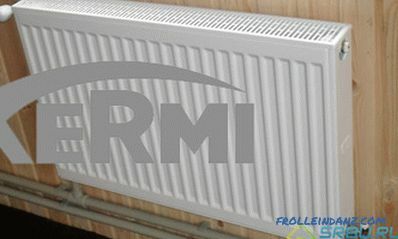 The most notable manufacturers are: Ravak - Czech Republic, Cersanit and Kolo - Poland, Pool Spa - Spain, Riho - Holland, Duravit - Germany. 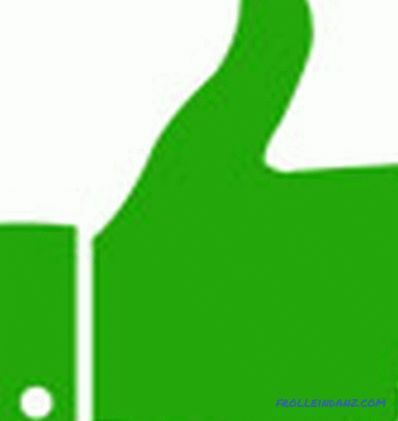 Of the Russian manufacturers, the most popular is the plumbing company Aquanet. 4. 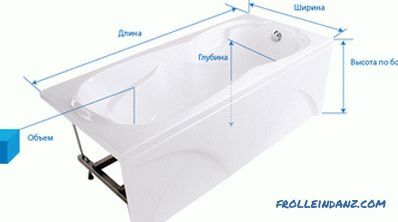 Quarille baths are made and sold by only one German company, Villeroy. Boch. The company is both a developer, technology, and material developer, and in fact, a manufacturer of sanitary ware. Therefore, you should not believe when they are trying to sell you a supposedly quart bath from some little-known manufacturer. Either it is a fake, or the seller himself does not know what he sells. 5. Ceramics baths in the domestic market are represented by Russian companies Santek and TM Colombo. From foreign manufacturers can be distinguished two Italian companies Flaminia and Globo.